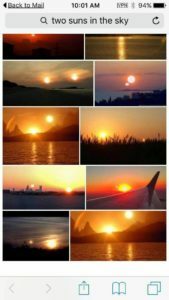 USA and CANADA saw two suns (Hunters Moon) - Fake or Real ? USA and CANADA saw two suns (Hunters Moon) – Fake or Real ? The Miracle has happened today. USA and CANADA saw two suns. This is called as Hunters Moon.. Due to change of orbit the sun sets and moon rises at the same time with both being opposite to each other at a particular angle or degree moon reflects the sun so bright that it almost feels like another sun. Is there any such true news or this is another Scam/ Spam post that is circulating on social media ?